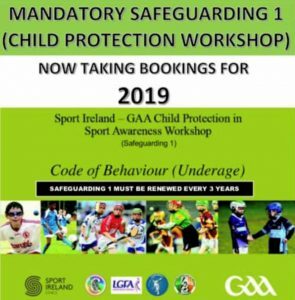 All persons with responsibility for underage persons in their care must attend and complete Safeguarding 1, GAA Child Protection in Sport Awareness Workshop. This includes coaches, tutors, mentors, managers, Children’s Officers, Designated Liaison Person (DLP) and anyone deemed to require the training . The course is a 3 hour Workshop highlighting best practice in Safeguarding and welfare of children in sport. At present you may not be involved in any of the above roles but you should leave your self with the option as it is now a requirement to have this course completed. It is also a great importunity to get the course done . We need to get as many people as possible to attend this course. 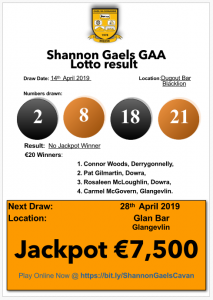 The course is normally held in Cavan so we are fortunate to get it to Glangevlin. There is a small cost of €5/person. Representatives from Swanlinbar and Corlough GAA Clubs will also be attending. Minimum number attending is 16, maximum is 20 so it is important that you let me know as soon as possible if you will attend. I need a name and telephone number of those attending. Please respond by email chairperson.shannongaels.cavan@gaa.ie or text on 087 2932097. Note anyone under the age of 18 hoping to attend must get a signed parental consent form handed in on the night.